Photo: Howey House, ca. 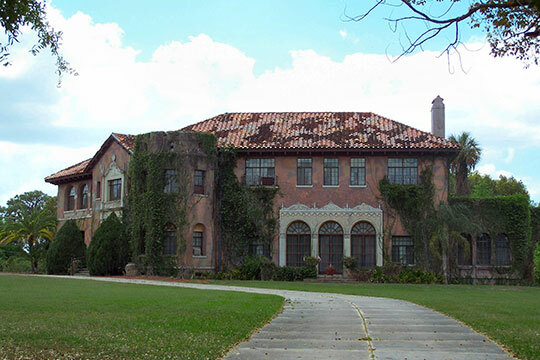 1926, Howey-in-the-Hills, Lake County, FL. Listed on the National Register of Historic Places in 1983. Photographed by User:Ebyabe, 2007, [cc-by-2.5 (creativecommons.org/licenses/by/2.5/deed.en)], via Wikimedia Commons, accessed February, 2015. Lake County administrative offices are located at 315 West Main Street, Tavares, FL 32778; phone: 352-343-9800. Lake County was incorporated in 1887 from Orange and Sumter counties. There are more than 1,400 lakes in the county, thus, its name. Sugarloaf Mountain, the highest point on the Florida peninsula, is located within the county.